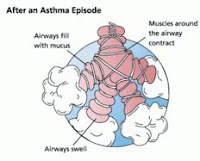 Allergy Notes: Asthma endotypes: does it matter when considering which treatment to recommend? Asthma endotypes: does it matter when considering which treatment to recommend? This review article evaluated human clinical trials using biologics for T-helper type 2 cell (TH2)-low and TH2-high asthma. Many of the TH2-high therapies have shown better efficacy when certain biomarkers are elevated, especially blood eosinophils. The TH2-low endotype does not have any readily available point-of-care biomarkers, and development of therapies has lagged behind that for TH2-high asthma. Characterization of asthma endotypes: implications for therapy. Jeffrey R. Stokes et al. Annals of Allergy, Asthma and Immunology, August 2016, Volume 117, Issue 2, Pages 121–125 (free full text). Image source: Image source: FDA and Wikipedia, public domain.